Just a note of thanks for posting that article on your website about the harmonic curve and harp strings. This is a 9th century Irish psaltery from a carving on a stone pillar in Co Donegal ,ireland that I made. And it would have been a real string breaker if I hadn't found your article. Thanks! I love you guys, and tell my friends about you every chance I get. 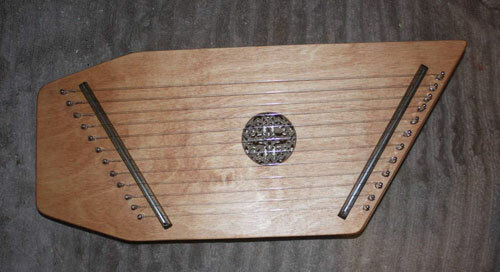 I bought the hardware and strings I used to make this psaltery from you guys. Happy new year to you. Stay warm up there in the frozen north! Thank you for the book, it's just what I need to get going, I'm a furniture maker so the woodwork side is no problem but the info on string length's, tensions and the harmonic curve are excellent, no math! The service was also excellent and I look forward to doing business with you in the future. I am reading your folk harp design and construction book these days, with great interest, I like the practical approach and the balance between theory and practical tips. I have already built an "almost Limerick" from your blueprint, I call it "almost Limerick" as I chose a different shape for the neck and pillar, but the geometry is all yours. The harp turned to be a good one, different skilled harpists have already tried it and each time it is appreciated for the sound, especially at the bass end, which is quite a surprise for such a small harp. So, congratulations for your design, it has to be a really good one if it led to a successful instrument at my first try at building one, and in spite of some errors I made (I had not bought your book yet). "This book will have a very important place in my library of reference materials. In fact -- and perhaps this is the highest praise one instrument maker can give another -- it has caused me to start rethinking some elements of my own harp designs, and has hopefully put me on the road to being a better harp maker! " This quote is from Fred Casey's review of Jerry's book in the American Lutherie Magazine. Read the full review here. Having had the experience of building my first harp ( a 36-string Paraguayan-style harp from John Kovac's plans) I realized that the greatest benefit of the experience was that it enabled me to begin to formulate more intelligent questions about harp-making. Now, as I've been reading- and re-reading - thru your book it seems that every other page elicits "Well, THAT page was worth the price of the book!" I cannot commend you enough for the clear expression of your points and opinions and the reasons behind them. I was in the process of designing my second harp when your book arrived. I'd drawn up a big diagram of parallel lines at the spacing I wanted -much as you present in your harp design worksheet - and had come up with a string angle. I now understand, however, that the "prettty" harmonic curve I'd settled on would have resulted in many broken strings in the treble range and a bunch of thunky duds in the bass.